MELVILLE, NEW YORK, March 14, 2019 - FONAR Corporation (NASDAQ-FONR), The Inventor of MR Scanning™, reported today publication of a chapter where the physician-author-researchers utilized the FONAR UPRIGHT® Multi-Position™ MRI. The title of their chapter is: Craniocervical Junction Syndrome: Anatomy of the Craniocervical and Atlantoaxial Junctions and the Effect of Misalignment on Cerebrospinal Fluid Flow. The chapter is in a book titled ‘Hydrocephalus - Water on the Brain’ and was published by IntechOpen, the world's leading publisher of Open Access books for scientists. The chapter can be found at: https://www.intechopen.com/books/hydrocephalus-water-on-the-brain/craniocervical-junction-syndrome-anatomy-of-the-craniocervical-and-atlantoaxial-junctions-and-the-ef. The authors are Drs. Scott Rosa, John W. Baird, David Harshfield and Mahan Chehrenama. 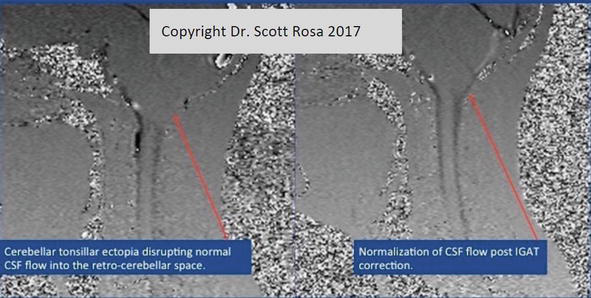 Dr. Rosa has developed a patented method to restore cerebrospinal integrity by correcting misalignments at the cranio-cervical junction (CCJ). The method is called Image Guided Atlas Treatment™ or IGAT™. He says that the FONAR UPRIGHT® MRI and its imaging sequences are a critical part of the IGAT™ methodology in correcting the misalignments found at the CCJ. 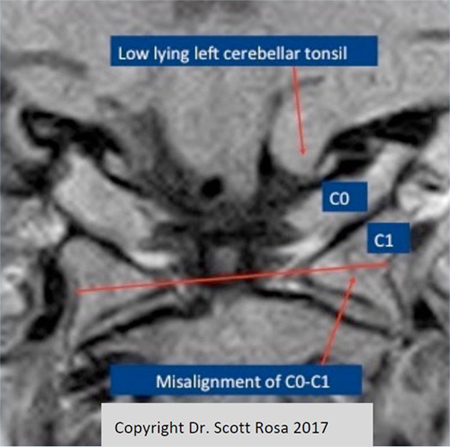 This is because only the FONAR UPRIGHT® MRI can visualize the CCJ in the upright, fully weight-loaded position, necessary for detecting fully distended cerebellar tonsillar ectopia and CSF flow impeding vertebral malalignments. “I would like to thank the authors for this thorough research publication and their past and continued efforts towards the understanding of the “craniocervical syndrome” (CCS) and “craniocervical joint dysfunction”. FONAR’s own research validates their work. In the future, continued understanding of the CCS may plausibly have a significant impact on the genesis and treatments of the many neurodegenerative diseases that plague mankind. These include multiple sclerosis, amyotrophic lateral sclerosis (Lou Gehrig’s Disease), Alzheimer’s, Parkinson’s and additionally the non neurodegenerative disease childhood autism and birth injury Cerebral Palsy.” concluded Dr. Damadian. Following are figures 6, 9 and 11 from the online Chapter 3. Figures 6 and 9 demonstrate an example of the cervical misalignment that can be realigned by IGAT™. Figure 11 shows a CSF flow cinematic MRI in the pre-IGAT™ and post-IGAT™ on the same patient. “All MRI images in the chapter 3 were taken on the FONAR UPRIGHT® Multi-Position™ MRI,” said Dr. Rosa. This press release contains an actual CSF flow cinematic which is different from the static-only picture for Figure 11 in the online published chapter. on phase contrast cine CSF flow MR.
FONAR, The Inventor of MR Scanning™, is located in Melville, NY, was incorporated in 1978, and is the first, oldest and most experienced MRI company in the industry. FONAR introduced the world’s first commercial MRI in 1980, and went public in 1981. FONAR’s signature product is the FONAR UPRIGHT® Multi-Position™ MRI (also known as the Stand-Up® MRI), the only whole-body MRI that performs Position™ Imaging (pMRI™) and scans patients in numerous weight-bearing positions, i.e. standing, sitting, in flexion and extension, as well as the conventional lie-down position. The FONAR UPRIGHT® MRI often detects patient problems that other MRI scanners cannot because they are lie-down and ”weightless” only scanners. The patient-friendly UPRIGHT® MRI has a near-zero patient claustrophobic rejection rate. As a FONAR customer states, “If the patient is claustrophobic in this scanner, they’ll be claustrophobic in my parking lot.” Approximately 85% of patients are scanned sitting while watching TV. FONAR has new works-in-progress technology for visualizing and quantifying the cerebral hydraulics of the central nervous system, the flow of cerebrospinal fluid (CSF), which circulates throughout the brain and vertebral column at the rate of 32 quarts per day. This imaging and quantifying of the dynamics of this vital life-sustaining physiology of the body’s neurologic system has been made possible first by FONAR’s introduction of the MRI and now by this latest works-in-progress method for quantifying CSF in all the normal positions of the body, particularly in its upright flow against gravity. Patients with whiplash or other neck injuries are among those who will benefit from FONAR's new technology for quantifying CSF flow and the new clinical understanding it provides.